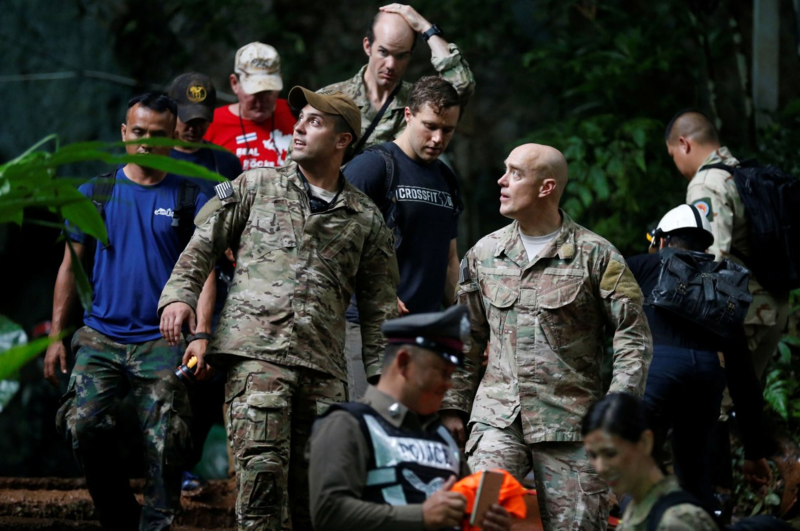 The U.S. military team is offering a hand, along with British cave experts, to join the rescue effort in northern Thailand for the missing 12 boys and their soccer coach inside a cave being flooded by almost non-stop rains. The team has been missing for five days now. The constant rains have been making the rescue more challenging. Earlier today the overnight rain had raised water levels again and authorities switched off power and water pumps due to possible electrical hazards. Power had just been installed a few days earlier to provide lights and better communications and pump out water. The U.S. military team already went inside the cave and rescuers were continuing to work despite the weather challenges and other problems. The U.K. diving experts joined the U.S. team. Maj. Gen Bancha Duriyapat is coordinating the rescue effort. At a morning briefing between the Thai SEALS and the U.S. team, the Thais detailed that water levels had been rising overnight at a rate of about 6 inches per hour, further complicating efforts to squeeze through tight passages, some of which necessitate the divers to contort their bodies around L-shaped bends. The soccer team and coach entered the Tham Luang Nang Non-cave in Chiang Rai province on Saturday afternoon. The cave is several miles-long with narrow passageways and uneven ground and is known to flood badly when it rains continuously. There is still a ray of hope that the team may survive and be rescued as authorities said there are dry places on higher ground within the cave where the group may be able to wait. It’s not certain, however, if they have brought food and water with them. An expert said, however, that the boys-athletes’ youth and health are to their advantage. If the cave is not too cold, their chances of survival increases. They should be able to survive four to five days without water and a month or more with water but no food. 600 rescuers are already working above ground trying to find shafts that might be able to enter the cave. The few available shafts so far did not provide access. The authorities committed that they won’t give up until the team has been found, and hopefully, rescued. The U.S. Indo-Pacific Command in Hawaii confirmed that a U.S. team of about 30 people was sent to assist the search. Navy Lt. Cmdr. Nicole Schwegman said Wednesday that a search and rescue team had been sent at the request of Thailand’s government. Thailand is one of the closest allies of the U.S. in Southeast Asia. a real life nightmare. stay out of caves!